Craggaunowen Pre-Historic Park to the life of the hunter-gatherer in the Ring Fort - less than 30 minutes from Hotel Woodstock. 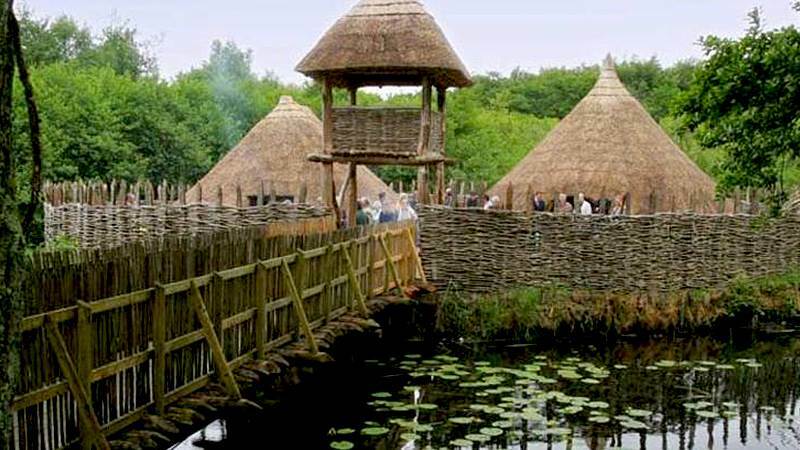 You will see how the Celts carried out their every-day activities as they cooked over open fires or in pits; ground corn for making bread or porridge on hand-powered querns; or made pottery, wooden bowls, goblets and platters. Explore Craggaunowen Castle the 16th century restored Medieval Castle built in 1550 standing defiantly on a crag overlooking the lake and enjoy magnificient views of the countryside. Observe rare and really interesting animal breeds such as wild boar and soay sheep - specimens of the pre-historic era. Visit one of Ireland’s earliest roadways or ‘togher’ dating to 148 BC. Exploring the Souterrain is fun - designed to store food but these were often a welcome escape route when under attack from the enemy! Good place for hide and seek! Enjoy the fresh air and lake walks in a most enjoyable rural setting. Savour our wonderful homemade fare in the charming farmhouse tea-room.